I recently took a trip into the garment district, and for the first time in years I didn’t have a list of projects I was shopping for. However I did have a list of materials to keep an eye out for, and one of those was lightweight cotton. Lightweight cottons are incredibly versatile – they can be used for foundation garments from any period, gauzy dresses from the 18th century to the mid 1800’s, and more practical pieces from the beginning of the 20th century. I’ve always found it difficult to find lightweight, soft, yet sturdy cottons that would work for these pieces. Especially since (for me) a big part of a garment looking authentic is it’s texture – which is one of the challenges with plain cottons. They don’t have a lot of it, and garments can look cheap or flat regardless of how well constructed they are. Which is why I really lucked out when I came across this striped cotton. 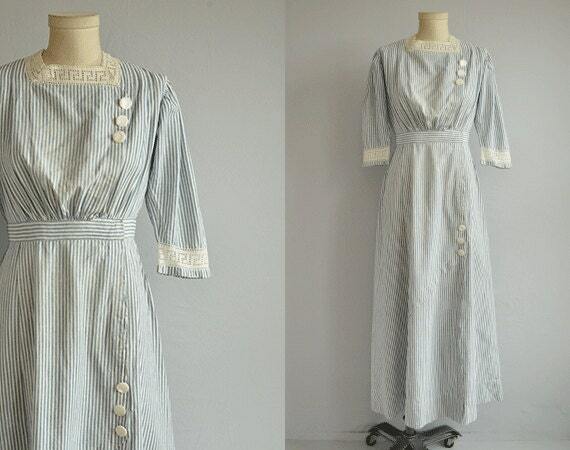 It has a faded look to it, and the dots buried in the stripes add a bit of life to it. I originally thought it was red and white, but it’s more of a mauve. 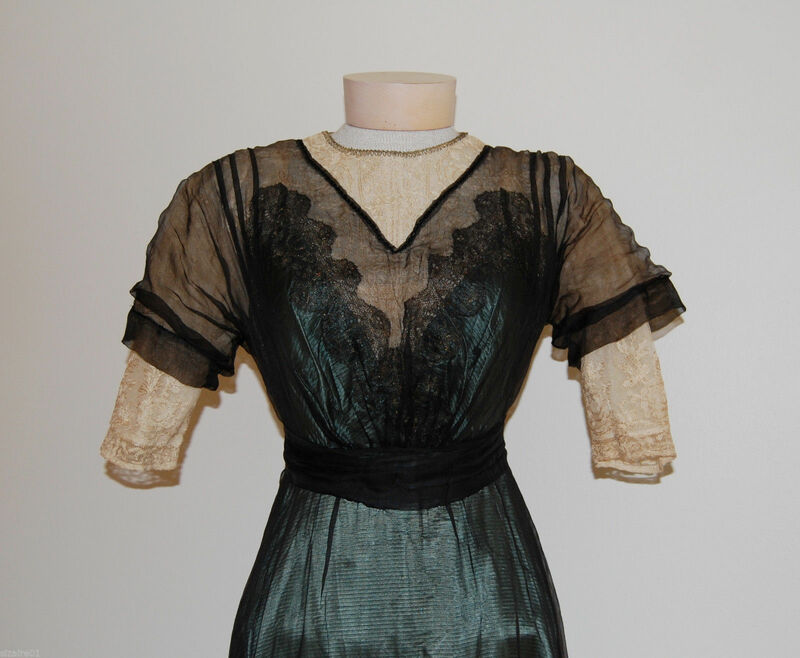 It’s very soft and slightly sheer – exactly what I hoped to find, and perfect for an edwardian day dress, which is what I decided to use it for! 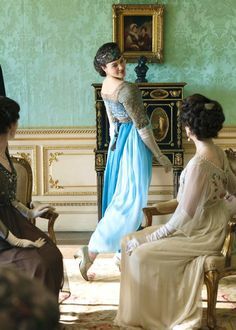 If you read my recent Progress Report you may recall me raving over fashion plates of 20th century ladies in antique magazines, which definitely served as inspiration for this style of dress. But my main reference was this dress – it was listed on etsy, with a bunch of close ups which helped me figure out the construction. I think the end result is pretty lovely – but let’s start at the beginning! Step one was draping. This was tricky to drape, since I wanted the oh so glamorous pigeon breast shape, where volume from the bust carries down the the waist, which is cinched in with gathers. It’s very easy to over exaggerate this shape and end up with way too much fabric in the front. I was also challenged by the pleats in the shoulder – they look okay here, but I was concerned the ends of the pleats would splay open when it was worn. The back has a box pleat in it, for decoration more than anything else. I transferred that to paper, then made a mock up. The pleats and amount of volume worked surprisingly well, so I moved on without any alterations. I cut all the pieces out, then marked the pleats on the wrong side of the fabric with pencil. They were ironed, pinned, then sewn down by hand. I also gathered the front of the bodice pieces. And the back. For some reason the pleat wasn’t symmetrical, which really bothers me! But I wasn’t sure how much fabric I would need for the skirt, and I didn’t want to waste any by recutting this piece, so I didn’t bother redoing it. Then I cut out a “facing” for the collar, which will actually serve as a base for the lace trim that will be shaped into a collar. This was pinned on top of the striped fabric to prevent the stripes from being visible through the lace. For lace I used a gathered eyelet trim from Jo-ann’s (I removed the gathers with a seam ripper, then ironed it flat) and a lace I got in a grab bag when I went to Lancaster. I wasn’t a big fan of this combination at first, but I don’t have a lot of white lace in my collection, so my options were limited. I sewed the lace together by hand, to create a single two inch wide unit. Then I pinned that onto the collar. And here it is sewn down. I had to pleat and gather parts, but after ironing it looked pretty smooth. It’s a bit hard to tell with the lighting, but the closure point is on the left side of the collar, imitating the dress I based this on. Now it was starting to look like a bodice! Since one of my goals for this was to keep it very lightweight, I decided not to fully line it. Instead I sewed the interior seams as french seams, and created a facing that extended from the neckline to the waistline. This was cut from muslin, then pinned to the right side of the fabric. I sewed it on with a half inch seam allowance, then turned it inward to hide the raw edges. I topstitched a quarter inch away from each edge by hand to prevent the facing from shifting and peaking out. I also tacked the far edges of the facing every few inches. Now onto sleeves! The pattern I created for this is pretty shoddy, but it worked! 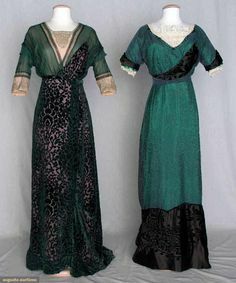 The sleeves have four tiers, three made from striped fabric, and one made of lace. The top tier has the stripes going vertically, tier two has the stripes going horizontally. Tier three is actually muslin, which the lace was sewn over, and tier four is more horizontal stripes. I’m really happy with how the sleeves turned out, I love playing with the grain lines in fabric, but it can be hard to do without wasting a lot of material – not to mention tedious. This was an easy way to sneak it in and add some interest to a simple dress. The lace pinned together – ready to be sewn together, then onto the sleeves. I left the sleeves unlined, since none of the fabrics are prone to fraying. But I did the side seam up as a french seam. Then the bottom edge was turned inward by a half inch. I loved working with this fabric since the stripes served as guidelines for where to sew. The tops of the sleeves were gathered down by hand and sewn onto the bodice by machine. Then the seam allowance was whip stitched together by hand. This isn’t the cleanest finish, but it was popular in the 19th century and avoids additional bulk in an area where mobility is important – so it works for me! Now I did a quick fitting and the end result wasn’t great. Though the pleats looked nice on my mockup, during this fitting they bunched really badly above the bust. There was a lot of folded material at the sides too, which was frustrating. I ended up mostly fixing this by tacking the pleats down further, and tapering the ends off almost like darts. I did this with pins on the left side, which looks a lot better than the right side. I think the folded material at the sides was caused by excess fabric in the back, which I fixed by gathering the center back portion down to be an inch and a half smaller. I also regathered the front panels so the volume was more focused at the front of the bust. Later on I played around with foundation garments, and improved the shape even more – I found a ruffled corset cover made me look too barrel chested, but bust pads really improve the crinkling at the top of the corset. With the fit fixed, I pinned on the waistband. And that’s it for this post! Next up: the skirt, closures, hat, and finishing touches! It’s been a few weeks, but I think I’m back to my normal blogging schedule! I took on a commission that ate up two weeks of time, and have spent the last week trying to prepare videos for the next two months. Which hasn’t left me with a lot of time or enthusiasm for writing. But I do want to get back on track, and I’m starting by talking about my plan for a winter coat! I really like making jackets and coats, so it seemed appropriate to make myself one that I could wear on a regular basis. But to make it more interesting I decided to base it off of designs from a period I haven’t explored much before – the 1920’s. A while back I came across this post, and fell in love with some of the designs in the Bellas Hess catalogue. I used those as inspiration and will be incorporating a lot of the detailing into my jacket, I just slimmed the silhouette by a lot to make it more flattering. For this project I’m using a faux wool flannel from Joanns, I like the texture and weight of this a lot. I also bought a fun flannel for the lining, and a polyester silky lining for the sleeves and front panels (to make the jacket easier to get on, and to avoid bulk). Then on etsy I found these beautiful vintage buttons – they are a bit smaller than I wanted, but I love the design too much to care. They are a rich orange color, with copper stars on the front. I paid seven dollars for sixteen. The seller doesn’t have any more listed, but they have some other neat ones and they are way cheaper than buying carded buttons in store! I draped the pattern the way I usually do. This was my first time (successfully) draping an asymmetrical pattern, so that was interesting! The only things I knew about drafting asymmetrical jackets were from this book*…but they involve a lot of darts, and are very fitted, so it didn’t prove to be very helpful. But I eventually figured it out! After draping I transferred the pieces to paper to create a pattern. I worked on the collar first since it’s the most striking part of this design. The collar is made from four pieces (two on each side) with an additional four pieces cut out for lining. Both the top layer of the collar, and the lining were cut from the faux wool. Then I backed the pieces with interfacing, which was cut to sit half an inch away from each edge. All the pieces were sewn together. In this state it has the shape of a giant dead moth. Glamorous. Then I pinned the top layer and lining together, making sure all the points lined up. I sewed the pieces together with a quarter inch seam allowance, then turned it the right way out. It’s such a crazy shape, I love it. Here you can see the back of it on my dress form. Now onto the bodice portion! I started by cutting everything out, and adding interfacing to the panel that will overlap the other. Then I sewed all the pieces together. And the same process with the lining. As you can see the back portion of the lining is cut from printed flannel, and the front portions from silky lining to avoid excess bulk. I cut the very front of one side of the lining from the faux wool, just in case a bit of the lining is visible after it’s all put together. Then I pinned those layers together across the neckline, arm openings, and front edge. I sewed around those edges as well. I pinned around the arm openings. Then topstitched across those edges with brown thread. Around this point my buttons arrived, and I loved them soo much that I decided to topstitch the jacket with thread that matched them. This was a great idea in theory, but I have a machine made for lightweight fabric. And when I work with many layers of heavy fabric, it has the tendency of skipping stitches (even after changing the needle and making new bobbins). The topstitching runs across the front edges of the jacket and the edges of the collar. With that done I gathered the front panels of the jacket. Then sewed on the waistband. I topstitched it on with one row of stitching, but I think I’ll add another row later so it matches the topstitching on the rest of the jacket. And I sewed the shoulder seam up with a french seam. Here it is pinned on my dress form with the buttons (roughly) in place. I want to move them closer together, but my inspiration coats don’t have many buttons. Then again, they have much larger buttons so the proportion is different. I’m going to wait until the rest of the coat is done before deciding for sure. Then the collar was sewn on by hand, with heavy duty thread and a whip stitch. It still needs closures and sleeves, but the top of this coat is done! I reached this stage a couple weeks ago but have been too busy to make more progress since then. I’m hoping I’ll have time to finish it this week since I want to start wearing it already! And the back. I love the collar soo much. If you’re interested I also have a video showing this process, it can be watched here, or down below depending on your browser/email settings! 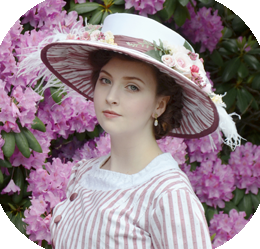 This week I have the second (and final) post to share about making my embellished edwardian ensemble! 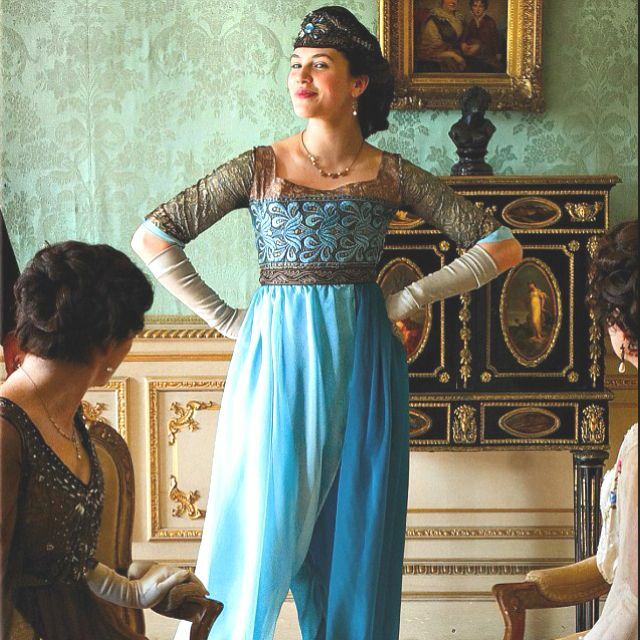 Part one can be read here, and talks about making the bodice and starting the sleeves. The bodice was almost finished, but still needed a bit more sparkle. I accomplished this by covering the stitching that attached the bodice together with tiny sequins and beads. I think the end result is very pretty, there is so much texture and sparkle! Then I folded the back edges inward and added a piece of boning to the lower portion of the bodice. The boning supports six eyelets that are embroidered onto each side of the back of the bodice. The top portion of the bodice closes with hooks and eyes for a clean finish. I chose to make the back lace up since I wanted the bodice to be as fitted as possible, and because laces allow me to get the bodice on and off without help. Now back to the sleeves! I sewed organza backed lace trim onto the hem of each sleeve. Then I covered the top edge with sequins so it wouldn’t fray. With that done I pinned the back seam closed so I could do a quick fitting. Unfortunately the sleeves were a bit too small – I could get them on, but it wasn’t easy. So I decided to sew the seam up with a half inch allowance, instead of the french seam I had planned, giving me an inch of additional room in each sleeve. I finished all the edges of the sleeves with lace tape. The only downside to the smaller seam allowance is that it means the stitching used to secure the chiffon to the lace is visible. It falls underneath my arm, and matches the fabric, so it isn’t too noticeable, but it annoys me nonetheless! I sewed the sleeves onto the bodice by machine with a half inch seam allowance, and then the bodice was complete! I’m really happy with this, I love all the detail work and how all the different fabrics and textures work together. It’s well constructed too, which i’m proud of since this was made in a relatively short amount of time. But I wasn’t happy for long because I had to work on the pants. The chiffon pants. I don’t like pants, or chiffon so the combination didn’t seem like much fun (and it wasn’t). It was however, very confusing. So I’m sorry if my explanations are confusing, but I’m not sure how to avoid that since I’m still confused and I’m the one who made them! At first I thought these would be easy to make – a typical drop crotch pant with an asymmetric draped panel at the front, no problem! Then I realized the draped portion is actually sewn into the inseam somehow and that the back is asymmetrical too. Before even trying to figure out how that would work I made the base pattern. Which is just a longer version of the pattern I made for my cycling bloomers. I made the crotch lower too, but that was the only big change aside from length. I cut two of each pattern piece out from my “base” fabric – which is a gold chiffon. Then I cut the front left panel out again, this time from a orange chiffon, and I extended the panel to be thirty inches wider at the side seam. Then I did the same thing with the back right panel and pink chiffon. The pieces looked like this. Now for the confusing part. I basted the wider panels to the matching pieces (front left was basted to the front left cut from base fabric, and same process for the back panels) at the crotch seam and inseam. Then I sewed the crotch seam for the front and back panels AND I sewed the side seams of the base layer together with french seams. Once I put it on my dress form and loosely pinned the waistline it looked like this. I can practically hear your skepticism but have faith! The thirty inches of fabric I added to the overlay panels wrap around the body and create the draped front and back. It’s kind of confusing because the front panel wraps around the back of the pants, and the back panel wraps around the front. But it totally worked! I gathered the top edges of the overlay panels down so they were the same width as the base layer of fabric. I tucked the front edges inward twice, by around two inches so a raw edge wouldn’t be visible. Then sewed it onto the waistline of the base panels so it hangs asymmetrically. I cut a slit into the back of the base panel, then covered it with ribbon so the edges wouldn’t fray. I mounted four hooks and bars onto the ribbon, which is how I get the pants on and off. This slit is covered by the overlay once the waistband is done up. After a bit more gathering the waist of the pants was twenty eight inches, exactly what I wanted! As you can see I left the very front of the draped panels ungathered since I thought that looked nicer. Now the waistband could be sewn on. I used a rectangle of interfaced brocade for this. It was sewn on with the right sides facing each other, then tucked over the raw edge and sewn down once again. This is the finished waistband from the front side. It doesn’t look too pretty, but it isn’t visible when the ensemble is worn so i’m not too bothered by it! It also closes with hooks and bars. Here you can see it on my dress form. It still doesn’t look too promising, but I was pretty happy with this! At this point I pinned the overlay portions to the inseam of the base layer. Which looked like this! Then I did the inseam up with french seams. I hung the pants up, then used my scissors to level the hem to make sure the overlay was the same length as the base. I cut an inch of length off since I thought they were too long, then gathered the hem down by hand. I gathered this edge to be large enough to get over my foot, which left them significantly larger than my ankle. After a quick try on I realized a few issues. The first was that they were still too long. But I didn’t want to raise them from the hem, and it was too late to take them up at the waistline. The second was that I had no idea how I would get them over my feet after attaching the cuffs. I would have to cut a slash into them, but I knew that would look awful. But they needed cuffs. So I made some. And after pinning them on the length looked even worse since the cuffs caused them to sit higher on my leg. So I took the cuffs off and decided to bind the bottom edges with bias tape. It isn’t ideal, but the bottom edge is mostly covered by the volume of the pants. And this also means I don’t have to worry about adding a slash/closure method since they are large enough to fit over my feet. Also, since the bound edge is loose, they hang lower on my leg and the length looks more natural. For some stupid reason I used chiffon to bind the edges. I should have used a sturdier fabric or at least interfaced the chiffon first but clearly I was in a daze of frustration so I didn’t bother. End result: PANTS! I think these are the most unflattering thing I’ve ever made. I don’t mind shapeless garments if they have a nice shape but these are…difficult to pull off, to say the least? I think they look nice in a very specific pose (shown on the right) and when they are moving, but from the front it’s pretty rough. But that’s it! Here they are laid flat. Close up of the waistline. And the back – you can see how the overlay hides the slash! I made a little headpiece to go along with this costume. I didn’t love the crown it was paired with on the show, and I didn’t have enough trim left for anything really exciting. I ended up gluing some scraps of beaded trim onto a strip of lace, along with some glass montees and a few bits of an ostrich feather. The end result is more 1920s than edwardian, but I think it’s super pretty and fits with the rebellious nature of this ensemble. Now for the worn photos! I paired it with a blonde wig, some shoes from DSW, and knee length spanx since the pants were a bit more sheer than I had intended (an opaque lining would have been smart). 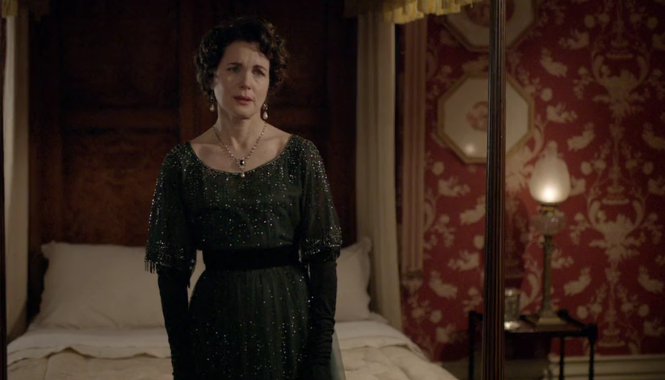 I also wore some earrings from the Downton Abbey collection, but you can’t really tell. I wish I had a necklace to go with this ensemble, I think the collar area is a bit bare. I was really tempted to get this this one* but figured I wouldn’t wear the costume often enough to justify it. But it matches so nicely…I might crack and get it anyway! Sorry for all the similar poses, as I said the pants are most flattering from that one specific angle! I think this was the first time I’ve been grateful for my height while wearing historical costumes as I think they would be even more of a challenge the shorter you are. And that’s it! I’m quite pleased with how this turned out. Even though the pants were a pain, I love the bodice and how all the fabrics work together. It’s very different from anything i’ve made recently, and only took a week to complete! I really want to do more of these week long projects, I always end up really enjoying them.